IPv6 is faster than IPv4. Nobody ever believes me when I tell them this, but the evidence is overwhelming. This APNIC chart shows some big spikes, but meaningfully, a significant number of IPv6 connections (the stuff to the left of center) are just a bit faster than IPv4, when measuring Round Trip Time (RTT). 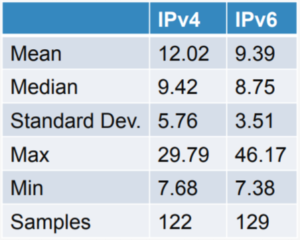 CableLabs did some lab testing, comparing IPv6 to NAT44, and found that IPv6 was faster in mean and median, though the highest sample was an outlier. They later tested against NAT444 (home gateway plus CGN) and that showed IPv4 faster, which makes even less sense. It’s hard to read, and the original has been lost in the mists of time. Each row is a popular web site. Each column is a TWC hub. In each column are two numbers representing round trip time in milliseconds from that hub to that web site: the left is IPv4 and the right is IPv6. 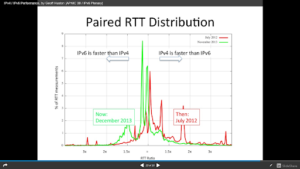 If IPv6 is 20% faster, the cell is highlighted in green. If IPv4 is 20% faster, the cell is highlighted in pink. Most measurements were within that different (no highlight), but you can also see that some hubs saw consistently faster IPv6, and some web sites saw consistently faster IPv4. On average, IPv6 was a bit faster. It’s an excellent paper, but the bullet points next to each chart give you the sense. The second chart shows timers relevant to Happy Eyeballs, which was used in the revision of that specification. 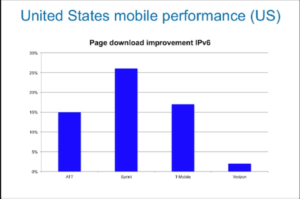 The AT&T and Sprint charts show show the page load time from those networks to a site with end-to-end (E2E) IPv4 and IPv6, and shows that web pages available on IPv6 consistently load faster than on IPv4. 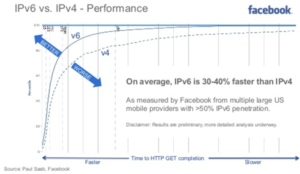 We performed such an experiment looking at one specific site (URL) on one specific device (iPhone) on one network (Verizon), and we saw that the selected sites load 5% faster in median and 15% faster for the 95% percentile on IPv6 compared to IPv4. 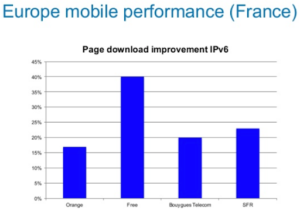 Measurements using Akamai’s RUM system have also shown measurable performance improvements for US mobile users from dual stacking content. To get this measurement, they subtract the IPv6 round trip time minus the IPv4 round trip time. So if the IPv6 time is lower, they’ll get a negative number. The only place IPv6 isn’t significantly faster is in Asia, and you can follow the link to see why. Or follow any of the links to drill down by country, and then by network. That’s a lot of different sources, over a long period of time, measuring actual Internet traffic, and finding that IPv6 is consistently, if not always, just a bit faster than IPv4. If improving performance by a few milliseconds per round trip is important, IPv6 is a straightforward way to achieve it.